Acclaimed for the beauty, precision and expressive qualities of their singing, the Atlanta Symphony Orchestra Choruses have been an important part of the Orchestra's programming since their founding by the late Robert Shaw. Both the ASO Chorus and Chamber Chorus are composed entirely of volunteers, who meet weekly for rehearsals and perform with the ASO several times each season. They are also featured on the majority of the ASO's recordings, having garnered 14 Grammy awards (9 for Best Choral Performance; 4 for Best Classical Recording and 1 for Best Opera Recording). The ASO Chorus made its debut on September 24, 1970. It regularly performs large choral/orchestral works under the batons of ASO Music Director Robert Spano and ASO Principal Guest Conductor Donald Runnicles. The Chorus has also sung for guest conductors such as John Adams, Roberto Abbado, Charles Dutoit, Alan Gilbert, Bernard Labadie, John Nelson and William Fred Scott. CLICK HERE to view a video about the Chorus at 40. The ASO Chamber Chorus (which debuted on December 14, 1967) performs music of the Baroque and Classical eras, as well as works by modern masters such as Golijov, Tavener, Pärt, Paulus, Theofanidis and Britten. Highlights of its history include a residency with the ASO and Robert Spano for California's Ojai Festival (read a review), participation with the ASO in Telarc recordings of masterworks by Bach, Golijov, Handel, Haydn, Mozart, Schubert and Vivaldi, a 2005 a cappella recording that features the Vaughan Williams Mass under Norman Mackenzie, an appearance on national television in 1987 performing Handel's Messiah with Robert Shaw, and several Carnegie Hall appearances which include performances of the B-Minor Mass, the St. Matthew and St. John Passions and Magnificat (read the review) of Bach, the Rachmaninoff Vespers, the Mozart/Levin Requiem, Messiaen's Trois petites liturgies and Stravinsky's Nightingale. The Chamber Chorus has also performed under the batons of Robert King and Nicholas McGegan. 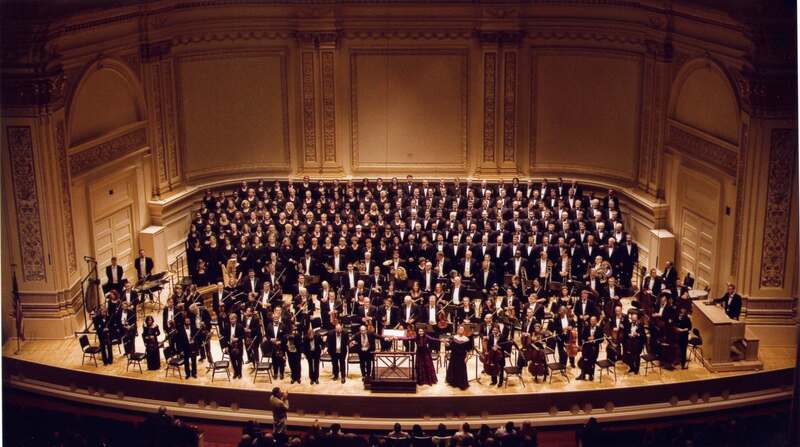 The ASO Chorus made its Carnegie Hall debut in 1976 with a performance of Beethoven's Symphony No. 9 and has returned to perform there 23 different times (11 with Robert Shaw, 1 with Norman Mackenzie, 1 with Donald Runnicles and 10 with Robert Spano). CLICK HERE for the details of each Carnegie Hall visit, and CLICK HERE to read the reviews of the 2016 appearance). The ASO Chorus performed in the Kennedy Center for President-elect Jimmy Carter's Inaugural Concert in 1977 and returned there with Robert Spano in 2017 as part of the SHIFT Festival]. In 1988, it accompanied the Orchestra on its first European tour, performing in New York, East Berlin, Zürich, Ludwigsburg, Paris, Bristol and London. 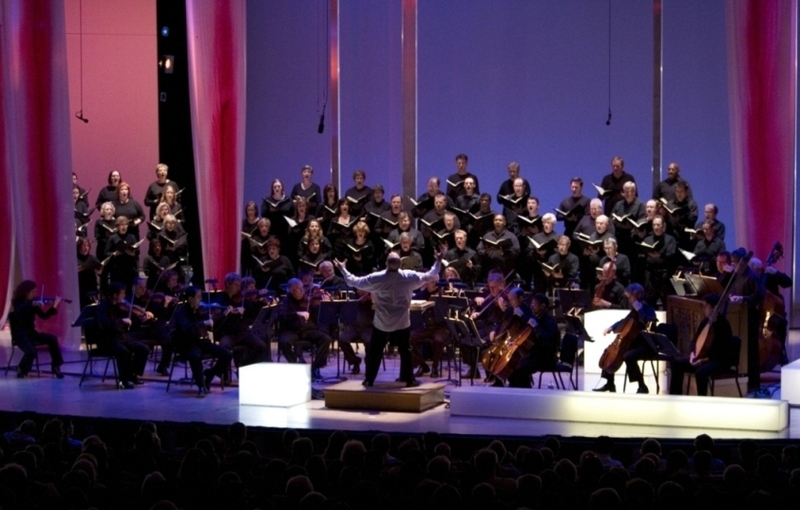 It has appeared with the ASO for televised concerts on several occasions, including the 1995 national broadcast of the orchestra's 50th-anniversary celebration, in which it was conducted by both Yoel Levi and Robert Shaw, and the statewide telecast honoring the Chorus's own 25th anniversary. With the ASO it appeared in the Opening Ceremony of the 1996 Olympic Games, broadcast worldwide. The ASO Chorus has participated for 30 years in the Martin Luther King Ecumenical Service sponsored each January by the King Center in Atlanta. The Chorus has also opened the Atlanta Falcons 2003 and 2004 football seasons with a 200-voice rendition of the National Anthem. Under the leadership of Music Directors Robert Shaw and Robert Spano, the ASO Chorus has been involved in the creation and shaping of 13 world-premiere commisioned choral works. CLICK HERE to view a list of these ASO-commissioned pieces and their recordings. The Choruses have been featured twice at the Ravinia Festival in Chicago: in June 2003 the Chorus, ASO and Robert Spano opened the festival with a critically acclaimed performance of John Adams' oratorio El Niño, followed by a 2006 visit by the women of the Chamber Chorus, the ASO and Robert Spano for Golijov's opera Ainadamar. 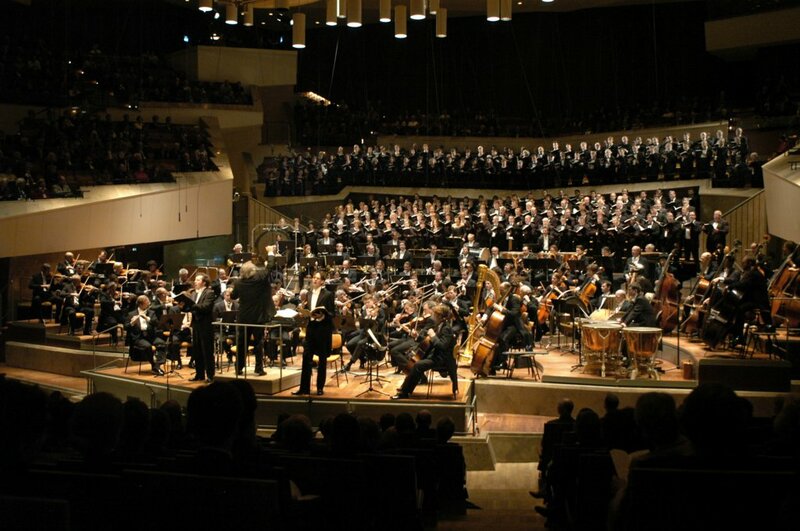 The ASO Chorus has also three times traveled to Germany with conductor Donald Runnicles to be a special guest of the Berlin Philharmonic at their home, the Berlin Philharmonie: in December 2003 with a series of three triumphant performances of Britten's War Requiem (read a 2003 review), in May 2008 for a series of three Berlioz Requiem concerts (read a 2008 review), and in December 2009 for a series of three Brahms Ein deutsches Requiem performances (read the 2009 reviews - German and English). -And CLICK HERE to read the April 2011 Georgia Music Magazine about the ASOC, incl. interviews with Robert Spano and Norman Mackenzie.